Mandala is a Sanskrit word meaning circle. They have been used in different cultures as a means of meditation and understanding more about one’s inner self. It can be in the form of a circle, square or any other pattern. But overall they tend to symbolize completeness and wholeness. 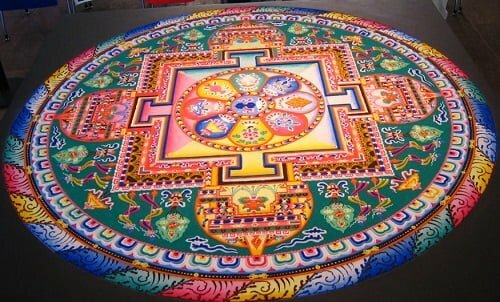 Individuals may create their own unique mandalas for the purpose of symbolizing and remembering their own personal journeys through life. They serve as a canvas, open to artistic design from anyone who wishes to tell their own story. No person’s story is bigger, smaller, better, or worse than another’s, for we are all connected in the universe. A personalized mandala allows someone to express their role and the unique path that they have taken. Groups or tribes can also express their growth and development, both physical and spiritual, in the form of mandalas. Mandala design is open to creativity, but does have a certain balance of visual elements. The concentric nature of the design is crucial for the symbolization of unity and harmony. However, each mandala is different, meaning that the interpretations vary to a certain degree. The possible combinations of design elements and the subsequent personal interpretations are incredibly versatile. The goal of these creations is to provide oneself or one’s group with a tool to use on his/her/their eternal spiritual journey. As long as people remember the general themes, the mandala is pretty much an “anything goes” symbol. As with all symbolism, the potential interpretations and what that means for the person are only limited by the creator and the observer. This leaves a nearly infinite amount of creative immunity. As previously mentioned, many common mandalas exist across the world and its ancient cultures. In Buddhism and Hinduism, there are chakra symbols, the Hindu yantra, and a specific sun yantra, to name only a few. Each is used as a meditation tool with focus on certain aspects of life. Native Americans also utilized mandalas in the spiritual courses of their lives. Across North America, the symbols for various entities and phenomena varied, but they seemed to follow general themes of enlightenment, reverence, and fearful worship. In these cultures, mandalas could be used individually, but were more commonly utilized during rituals and ceremonies. Some of the most universal Native American mandalas include the feather, sun, wind, dream catcher, and labyrinth. Each of these symbolized a different aspect of the incredibly spiritual world of Native American traditions. Across the land, the ancient Celts were also known for being highly spiritual and having a deep connection with nature. Some of their most popular Celtic Mandala symbolism included the Tree of Life, the Triquetra, the Celtic Knot, and the spiral meaning. These mandalas were used for similar introspective and personal betterment purposes. No matter which lens you look through to analyze the mandala, you will find a circular design reminding you that life is never-ending. These are a powerful breed of spiritual tool that can assist you in any part of your spiritual journey. Their diversity and widespread use across cultures and time should speak for itself.